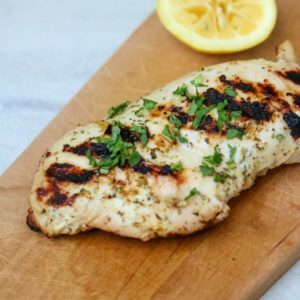 Greek Chicken Marinade: This easy Greek chicken is made with a flavorful Greek marinade that yields the most tender, juicy chicken. Perfect for prepping meals in advance, freezing or just a quick go-to chicken dinner. I have some fabulous news my friends….grilling season is in full swing. I don’t know about you, but this winter felt LONG. And spring was not much more pleasant this past year. But finally, the sun has come out to stay and I am ready to sit out on my back patio and fire up the grill to make delicious family dinners, like BBQ Chicken Burgers with Grilled Corn on the Cob and Grilled Fries. In my book, the key to a great grilled entree is all about the rub or the marinade. There is nothing like the smell of perfectly seasoned meat hitting the charcoal–it makes dinner really hard to wait for! You all know I have a SERIOUS love of all things Greek inspired. Greek Pinwheels, Greek Quinoa Salad, and Mediterranean Frittata just to name a few. So it was high time I shared with you one of my go-to marinades. It only takes a few simple ingredients to make an easy chicken marinade that will flavor your chicken (or pork or lamb) perfectly every single time. And aren’t we always looking for more easy chicken recipes? I know I am. Especially after I stock up on a family pack of chicken from BJ’s Wholesale Club. I love that with one quick trip to BJ’s, I am able to stock up on essentials for my pantry like olive oil, freezer bags, honey, and spices, along with grabbing all the fresh meat, dairy, and produce my family needs–all at a value! One of my favorite things to do after I purchase a large batch of chicken from BJ’s, is to make this easy Greek marinade. 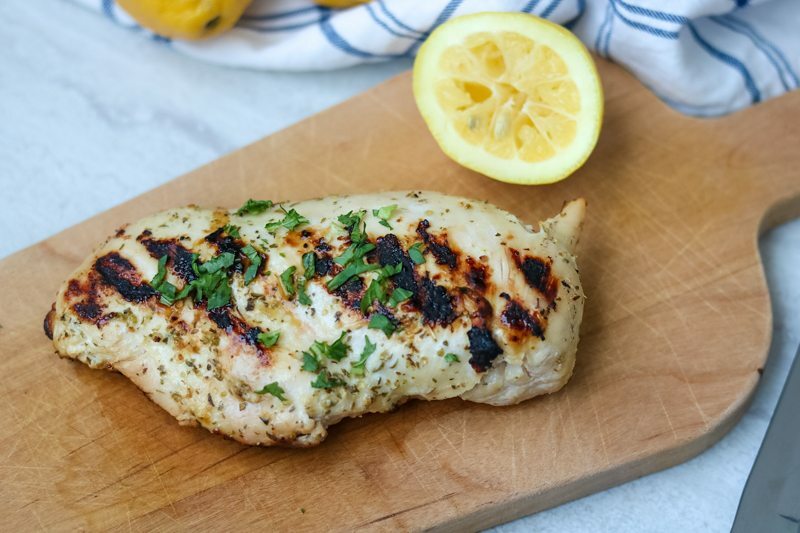 With fresh lemons, Wellsley Farms Greek yogurt, and oregano (all found in bulk at unbeatable prices at BJ’s), I can have a delicious marinade that takes chicken from ho-hum to juicy and flavorful. This Greek chicken is perfect for salads, wraps, or just to eat on it’s own. Not only do I like to whip this Greek marinated chicken up for a quick dinner after my grocery trip, I also like to make a large batch and freeze some of the chicken I purchased with the marinade–for a quick dinner on a busy night. Why use Greek yogurt for a chicken marinade? Tender chicken is the best, am I right or am I right? But getting tender chicken can be tough to achieve. One trick to tender chicken is a marinade that helps to tenderize chicken. Dairy-based marinades, such yogurt, are the BEST marinade to truly tenderize meats, as they break down the proteins to allow ultimate absorption of flavor. You can read more about the science behind marinating meats here. By using Greek yogurt, the chicken is broken down enough to absorb the lemon and oregano flavor easily, making for incredible Greek chicken. 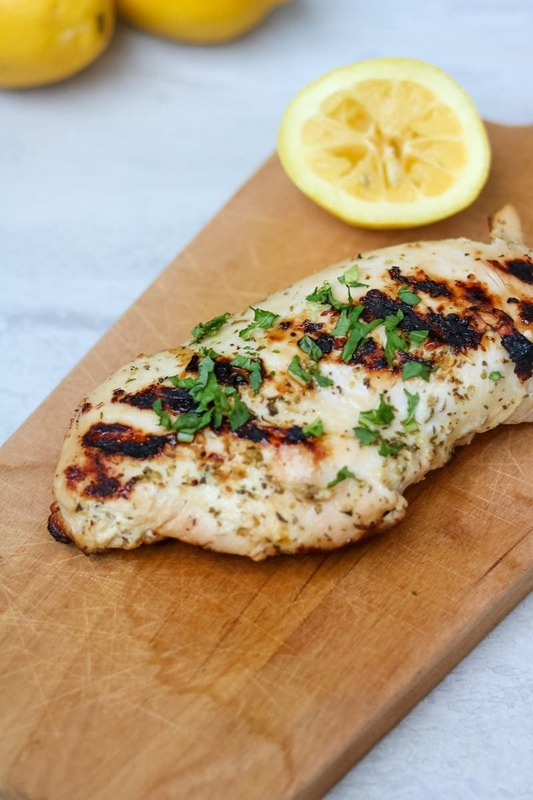 To make this simple Greek marinade for chicken, you need to start with dried oregano, Greek yogurt, fresh lemons, salt and chicken. 5 ingredients are all it takes to achieve perfection for a marinade. 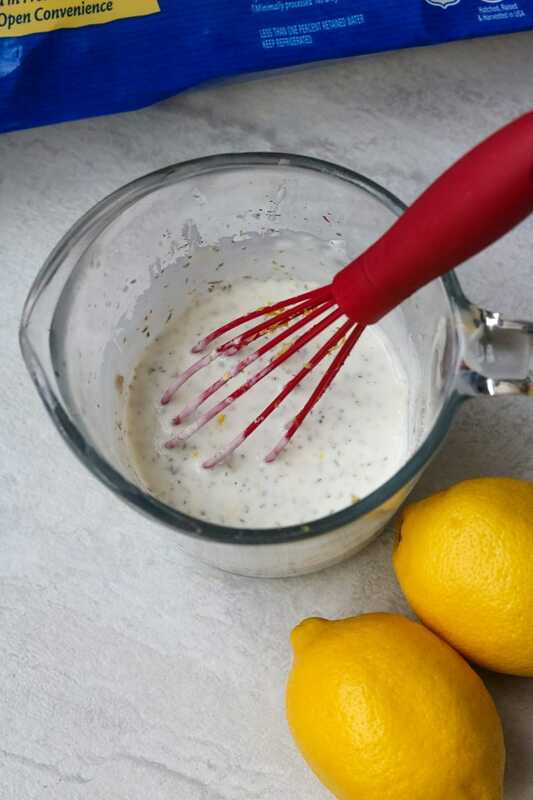 Whisk together the zest and juice of the lemon (be sure to see my nifty hack for juicing lemons), Greek yogurt, salt and oregano together and pour over chicken (just enough to coat). I recommend using freezer bags and dividing the chicken in 1-pound increments between the bags. This allows for easy clean-up and for you to throw your chicken in the marinade directly in the freezer if you don’t intend to cook immediately. You may be wondering if you can freeze Greek Yogurt with success. 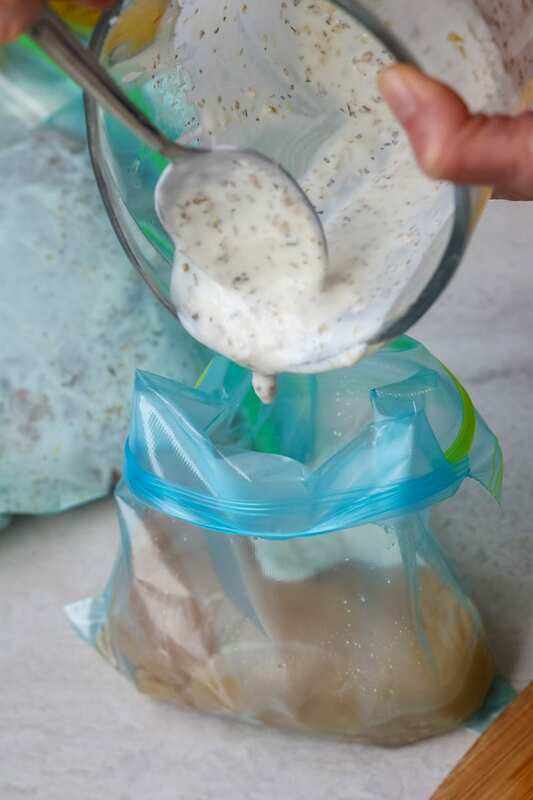 As soon as I pour the marinade over the chicken breasts (or chicken thighs or drumsticks), I tightly seal the bag and place directly into my freezer. When I am ready to make Greek chicken, I just place my bag of marinated chicken in the fridge to defrost overnight. As the chicken defrosts, the marinade works to flavor the chicken. 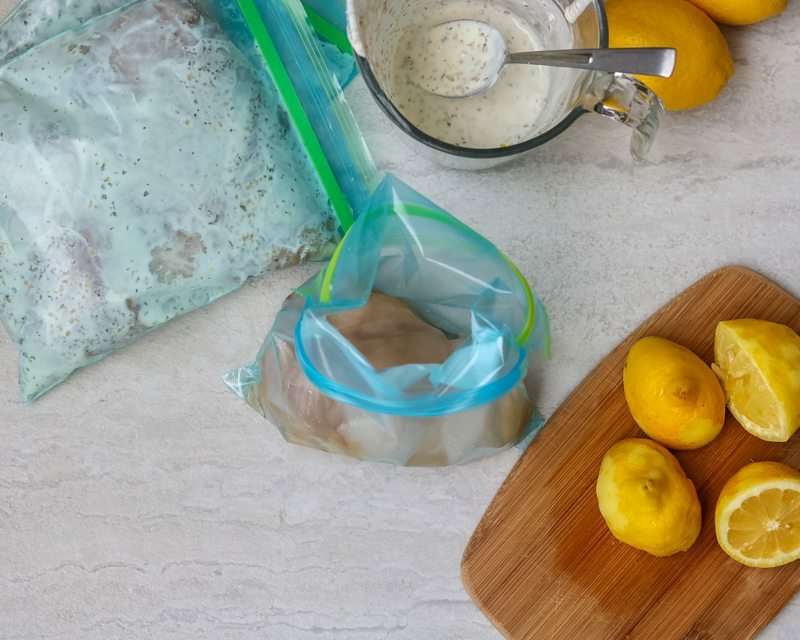 Freezing the chicken in the marinade is a great hack for easy meal prep. Alternatively, you can grill or bake all of your chicken at once and freeze the cooked chicken for quick meals or to use to serve alongside Chickpea salad or with a spinach salad. 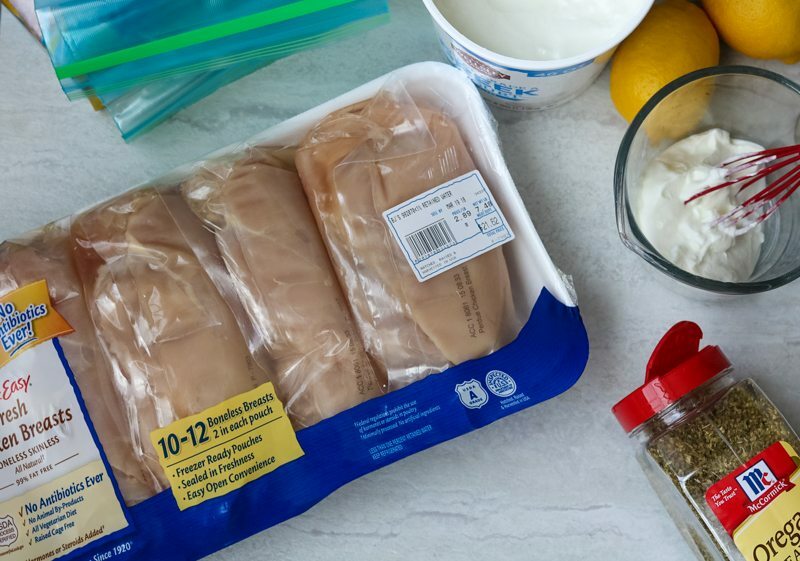 Note on Freezing Chicken in Marinade: Place the chicken in the freezer immediately after putting the chicken in the marinade and grill after it defrosts. I would not let the chicken defrost and sit in marinade for more than 4 hours as well (but you should have 24 hours after placing chicken from the freezer into the fridge before needing to cook the chicken). Thank you for bringing my mistake to my attention! When using this yogurt marinade, you do not want to let fresh chicken sit in the marinade for longer than 4 hours or the chicken may get broken down too much and become mushy. I find anywhere from 30 minutes to 2 hours ideal, but up to 4 hours is still fine. When defrosting chicken, as long as you cook the chicken within 24 hours of placing the frozen chicken in the refrigerator to defrost, you will have success. Grilling marinated Greek chicken is my favorite way to prepare this chicken. I love the smokey flavor the grill imparts to the meat. To grill Greek chicken, preheat your grill to medium-high heat (about 375 degrees). Remove chicken from marinade and grill on each side until the chicken reaches 165 degrees. Baking marinated Greek chicken is an easy method and perfect for rainy or cold days when you don’t feel like grilling. To bake Greek chicken, preheat your oven to 400 degrees. Remove chicken from marinade a place in 9×13 baking dish and bake until chicken reaches 165 degrees. This is another great method for cooking chicken on cold or rainy days, and when using a cast iron skillet, you can still achieve that golden crust on the Greek chicken. To cook Greek chicken in a skillet, preheat a heavy-bottomed skillet over medium-high heat. Add in 1 tablespoon oil and remove chicken from marinade and wipe off excess marinade. Cook until browned one side (3-4 minutes for breast, 5-7 minutes for chicken thigh or drumstick.) Turn chicken over, cover, and reduce heat to medium. Cook for approximately 6-8 more minutes or until the chicken reaches 165 degrees. You all know I love my easy Instant Pot recipes. However, usually cooking with dairy products is not recommended in the Instant Pot. Because the yogurt is absorbed by the chicken, you can still cook this Greek chicken in your instant pot with success using pot-in-pot method. I do find Instant Pot Greek chicken is best for shredding. For freshly marinated chicken: Remove chicken from marinade and place in oven safe dish that will fit on the rack of your pressure cooker. Place the rack inside the inner pot of your pressure cooker and pour in 1 cup of water. Place the dish with the chicken on the rack and close the lid. Cook on high pressure for 7 minutes for chicken breasts. (Yes, I know I normally say 6 minutes for fresh chicken breasts, but when using PIP you usually need to add 1 minute to cook time. Let pressure release naturally). For frozen marinated chicken: Place inner rack in pressure cooker and pour in 1 cup of water into inner pot. Place frozen chicken in oven safe dish and place on inner rack of pressure cooker. Set to 11 minutes on high pressure and let pressure release naturally. Note that the marinade may curdle slightly, but you can drain off the liquid and the meat still tastes delicious. The options for how you choose to serve this Greek chicken are endless. A simple meal of grilled Greek Chicken Breast with a baked sweet potato and green beans. 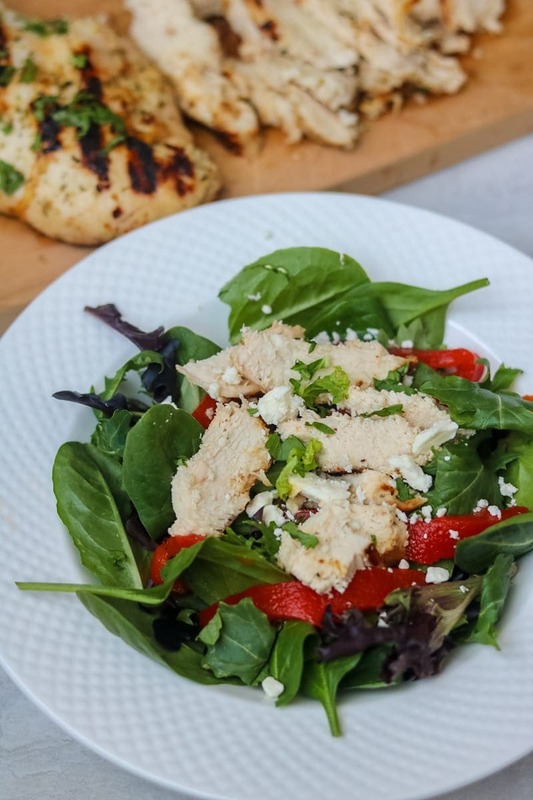 Greek Chicken Salad: bed of fresh greens with roasted red peppers, olives, feta and sliced Greek chicken with a drizzle of olive oil and fresh lemon juice. Greek Chicken Pita: Stuff a whole wheat pita with shredded or diced Greek chicken with fresh Greek yogurt, diced cucumber, onion and lettuce. An easy Greek Chicken Marinade recipe that yields the most tender, juicy chicken. Perfect for prepping meals in advance, freezing or just a quick go-to chicken dinner. This marinade yields enough for 3-4 pounds of chicken. Divide 3-4 pounds of chicken thighs, chicken breasts, or chicken drumsticks between 4 freezer safe bags and pour about 2/3 cups of marinade in each bag. Seal the bag and use hands to massage the marinade into the chicken. Either freeze immediately or let chicken marinade anywhere from 30 minutes to 4 hours before cooking. Defrost Chicken in refrigerator overnight. Take chicken out of fridge and let come to room temperature 15-20 minutes before cooking. Grill over medium-high heat for 5-6 minutes per side for chicken breast, 8-10 minutes for chicken thighs or drumsticks, or until chicken reaches internal temperature of 165 degrees. Preheat oven to 400 degrees. Place marinated chicken in baking dish and bake for 15-20 minutes for chicken breast, 35-40 minutes for thighs or drumsticks. Heat one tablespoon olive oil in a large non-stick skillet over medium high heat. Once very hot, remove chicken from marinade, scraping off excess marinade (so it will not splatter in oil). Cook until browned one side (3-4 minutes for breast, 5-7 minutes for chicken thigh or drumstick.) Turn chicken over, cover, and reduce heat to medium. Cook for approximately 6-8 more minutes (depending on thickness and cut of chicken), or until chicken is cooked to 165 degrees. This marinade works for chicken, pork, or lamb. Nutrition values are based on marinade. This is simply brilliant! It’s so easy and so versatile. This will set me up for quite a few freezer meals! Oh, and by the way, I have a thing for Greek/Mediterranean inspired dishes too. #twins. You like Mediterranean food?! Who would have guessed that?! This is the perfect dish to have in your freezer my sweet friend! I love how yogurt marinades really tenderize chicken. And I LOVE the flavor combo in this one – so yummy! What a great way to cook chicken! I bet it tastes amazing on a big salad. Love this easy recipe! Thanks Julie! I love this chicken piled high on a salad for sure! I totally agree that a dairy based marinade gives you nice and tender meat! I love this recipe because you can make it so many ways – grilled, baked or in the Instant Pot! Perfect! Thanks so much Erin! I love having various options depending on weather and timing restrictions. Glad you found them helpful. I love how easy and flavorful this marinade is! I am so glad you enjoyed Liz! We love it at our house! This is so easy! I love that you used yogurt to marinade your chicken. I bet it was really juicy and delicious! Thanks Shelby! The yogurt does keep the chicken super moist and full of flavor! You know I was a little unsure of the thought of yogurt in a marinade, but it turns out wonderfully! Delicious flavors and great with chicken. Yay!! I am so so happy to hear you tried this out Alyssa and enjoyed it! I’m always looking for great new ways to marinate my chicken! This was just what I was looking for! So glad you enjoyed Nellie! The yogurt really tenderizes the chicken. Tasted a little salty for me. Anyone else notice this? Hoping after it marinades it will not taste as salty once cooked. Hi Lorraine, the marinade will be salty. But the finished grilled chicken should not be–the salt just helps flavor the meat, but the majority of it is not absorbed by the chicken. In part of the article it states not to marinade it for more than 4 hrs because the yogurt will break down the chicken making it mushy. With this in mind is it still a good idea to freeze it in the marinade? That is a GREAT point. When I freeze the chicken in the marinade I place the chicken in the freezer immediately after putting the chicken in the marinade and grill after it defrosts. I need to clarify that in the directions (and will do so now). I would not let the chicken defrost and sit in marinade for more than 4 hours as well (but you should have 24 hours after placing chicken from the freezer into the fridge before needing to cook the chicken).